If you have an overabundance of zucchini on hand here’s a great way to use it. Aside from marinara you could try the spicy mayo or sun-dried tomato dip over at Savoring Every Bite. Place shredded zucchini in colander, over a bowl and sprinkle with one teaspoon salt. Wait 30 minutes stirring occasionally and pressing out the water. Put zucchini in dish towel, roll up and ring out any excess water remaining. Mix flour, one teaspoon salt, baking powder and baking soda. Add zucchini, pepper, onion and cheese. Mix well. Slowly add buttermilk until mixture forms a thick batter. Season with salt and pepper. Heat three tablespoons olive oil in large frying pan. Take 1/2 cup scoops of fritter batter and place in pan. Flatten out like a pancake and cook over medium heat until browned and cooked, six minutes a side. Replenish oil as needed and be careful to keep the fritters from sticking. Serve hot with marinara to dip in. Notes: If you don’t have buttermilk, you can put a third of a tablespoon of lemon juice or vinegar in your measuring cup and fill it the rest of the way to the 1/3 cup mark with regular milk. Let stand for five minutes before using. Speaking of substitutes for buttermilk, we’re still impressed with this example of kitchen improv over at Kitchen Belleicious. Warning it will make you even hungrier. This entry was posted in Dinner, Recipes, Sides and tagged fried, marinara, side dishes, vegetarian, zucchini. Bookmark the permalink. This sounds great. I love the mix with romano and buttermilk! Hahaha! You should see what I made tonight (which I’ll post in a few days). Apparently we were having a major mind-meld. Wow! Anyways, good stuff as always. Marinara is great idea. Sounds good! I might have to try those! Bringing the heat with the jalapenos man…that is what I like to see. Know what I will make tomorrow night with the zucchini I have. Thanks for the tasty recipe! I make something called Poor Man Meatballs that is similar but yours sounds zippy! Way to read my mind! 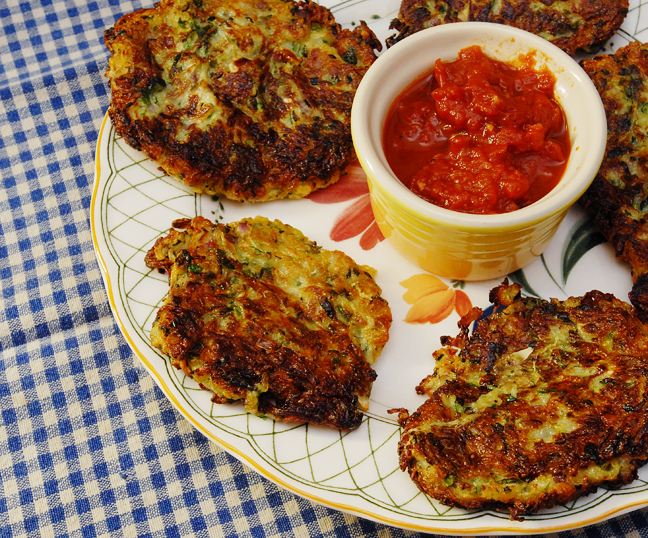 I have a recipe for zucchini fritters on the menu for later this week, though it’s thankfully not the same one. Wow. These sound and LOOK supreme! But, no egg? They hold together okay without it? I know some folks who would rejoice in this recipe. I would rejoice if I had some zukes! Ours never got to the pest stage, but were cooked before they were 1″ long. At 111 degrees in the shade, who knows what the temp was on bare soil in the sun? But I will cherish this recipe! i thought someone would ask that. They sure did. I think the cheese and the water from the vegetable held them together. Obviously, we got these at the farmers market. Sun-dried tomato dip would be perfect with these! Yum, they sound awesome. Even better that they’re not deep fried. We don’t like deep frying, just did it after a six-year hiatus. Katherine said OK no more deep frying. So it’ll be another six years! Now these look and sound way better than the ones we attempted a while back. I may revisit. You must be psychic – Big Man came home last night with 10 enormous zucchini and I had picked our first bowl of figs (yay!) and our first hot chilli peppers. I thought “I´ll head over to Greg & Katherine´s site to check out their fig and courgette recipes as I´m going to have a cooking day”…and here you are with my first recipe! They look amazing and even better that they´re not deep fried. Ha, I think this is one of our first zuc… courgette recipes too. Bring on the zucchini recipes! These fritters look great! And I agree with all who love that these are pan-fried using minimal oil and that you added jalapeños. We often makes potato cakes as a side in my house, but this looks like a great carb-less variation that I’d love to try. Like the addition of jalapenoes. What a great recipe to use zucchini!! I love fritters!! Buttermilk must give the dish a luscious touch!! Bravo!! Since zucchini are one of my three favourite vegetables and since your fritters look delicious, simple and not soaked in fat (as usually they do), I bookmark this recipe at once! Thank you for the buttermilk tips. Although I can find it in Switzerland, I have to go far to buy it. The soda trick is amazing! I like that this is not deep-fried. I think I’ll take this to a department dinner coming up. Thank you again. A recipe similar to this was on my list to make this week as well…I might have to try your version instead! Looks awesome! Love it – especially the cheese and peppers. So much healthier when not deep fried. Great looking dish. Now, that’s what I call ” mouth-watering goodness!” I tried stirred fried sweet potatoes . I’ve yet to try this. Thanks for sharing. Congrats for the Archive award from Just Ramblin’, Your blog is a gem! ooh the jalapeno is a great addition! and I love that trick for buttermilk since I can never make it through a whole carton and always feel bad buying it! The jalapeños and cheese really make your fritters special. I’m sure that the buttermilk made them nice and light. Must, try, very soon. Have seen a number of zucchini recipes of late, this one tops the list. Romano! Now that is one of my favorite cheeses to use in things but I can say I have never attempted it in zucchini cakes or anything of the like! Shear genuis. I can just taste those babies right now bursting with the fresh sweetness of the zucchini and cripsy texture of the cake! YUMMMMMM! Oh and thanks for the little shout out on the improv. It is something I totally did out of necessity but one I will certainly do again and again! You’re welcome. I use Romano in so much. I have a couple of zucchini waiting in the garden! Great recipe! These look fantastic and the perfect thing to make when you are craving “junk food” minus the junk! Yummy! Oh my, these look wonderful and I just happen to have some zucchini! Going to try this for sure. I also posted it on my Facebook page. I hope you don’t mind, just looked so good I wanted to share the recipe. Thanks for sharing. Look at you adding in those jalapenos!! Never thought of that one and I love heat!! Thanks for the mention; your fritters look really delish!! Not deep fried? Nice! They look really good. This looks delicious! And I love the idea of dipping in the sun-dried tomato dip. I like the jalapenos in there too! Oh, yes please and make it a double serving. I keep a container of dry buttermilk in my fridge. It lasts very well and is good in anything baked. I have a gluten-free recipe that I’ll post on my blog later. Made these! they were fantastic. I feel like I can’t catch up with the last couple of weeks I’ve been having.. but I’m not going to miss my favorite blogs. How did you know I LOVE Zucchini fritters? These look amazing.. I definitely have to make this before the summer is over. I just made a roasted red pepper and garlic dipping sauce last night for fried okra, but have a bunch leftover. This sounds like the perfect thing to pair it with. I do happen to have an abundance of zucchini thanks to my mom’s garden. I may have to try these. Love it! looks very healthy! Hilarious, I just posted a bunch of zucchini baking today as well!! Love this recipe! Definitely trying these out this week!! I made cour.. zucchini & feta fritters this week, I love them especially with mint but The Washer Up hates them I don’t understand it, he’s weird!! Those sound amazing to me! Most blogs I find do recipes that are some to my taste buds and some not so much…. this one however, your lovely blog that is… Every darn dish, is calling to me. These look like Saturday night to me! Good suggestion. We were having something else with marinara that night so it all worked together. But if we had this separate tzatziki would be great. These fritters look terrific and for sure I’m having more than one. Okay, more than two, haha! Have a great day and thank you for sharing the recipe. Ooooo! A recipe I’d like to make and eat! I enjoy shredding stuff in my food processor. Is that weird??? They look great! Love these! They look terrific and it’s one of my favorite ways to use zucchini! These look fabulous! Wishing I’d planted some zucchini this year! I need to make this again. I followed a Bittman recipe that didn’t require straining the liquid, and I thought “great, how easy, no extra step” and they were a disaster. I’m crazy about leek fritters and it’s really the same basic concept. Oh yes, especially since so many call for egg as a binder. Mine doesn’t. Anyway, so much water comes out. I’ve only cooked with zucchini once (filling for veggie lasagna) but I found that my potato ricer was really good for squeezing out the water from shredded veggies.